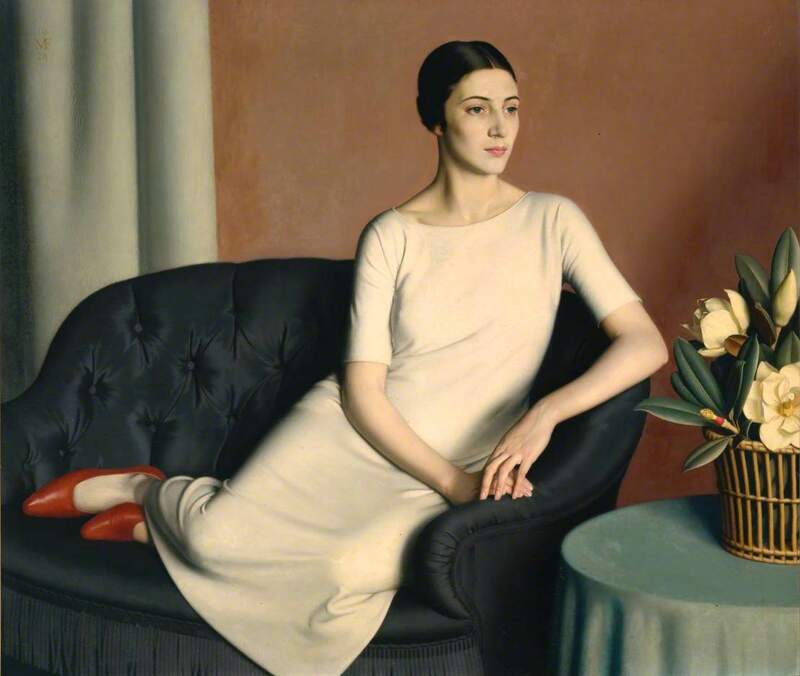 Having some knowledge of Socialist Realist Art from the erstwhile Socialist countries it was a pleasure to be able to visit the exhibition in Edinburgh, in the autumn of 2017, on British Realist Painting of the 1920s and 1930s to see what was shared – and what wasn’t. After all the style fell out of favour here and became a victim of the Cold War – collateral damage in the propaganda war against Communism. 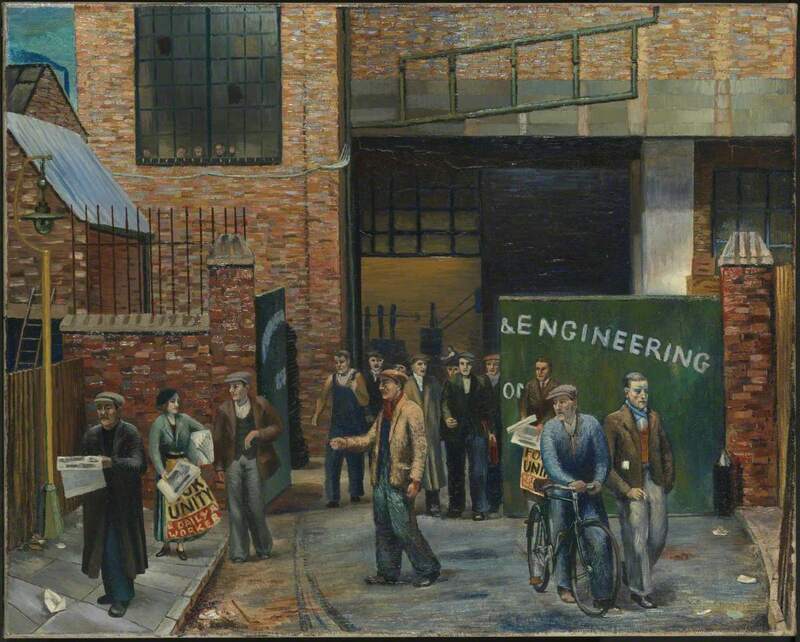 In the main, these examples of British Realism compared to Socialist Realism are as different as chalk and cheese. In Socialist Realism context is everything, the period in which a picture is painted, the reason for its creation, who or what is depicted and the audience at which the image is aimed are all important . With the British paintings what is most obvious from the start is the difference in the subjects. 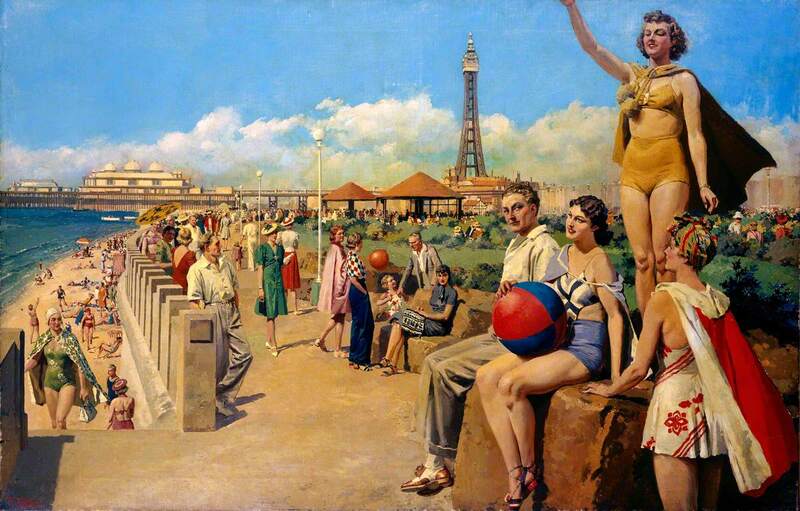 British Realism was fine art in its most literal sense. Some of the painters used single sable hair brushes in their work. Some of these paintings took years to complete. There’s no doubting the skill and draughtsmanship of such creations but they were, in many ways, products of their time and the social relations that existed in the decades between the two world wars. With few exceptions the principle of ‘art for art’s sake’ prevailed. They were vanity products of a privileged minority, who had private incomes, who came from ‘old’ wealth. Even those from working class backgrounds rarely reflected their heritage in the subjects and themes they chose to paint. Many of the male painters had direct experience of the First World War – although a few were pacifists or conscientious objectors and one, Maxwell Armfield, even went to the US to avoid conscription. Their rank during the conflict indicated their class background but most bullets and gas don’t respect class and many returned from the war scarred physically or mentally. Instead of reacting against the carnage most chose to retreat into an idealised past, or a beautiful present, rather than use their art to prevent such atrocities from being perpetrated in the future. This is especially obvious in an idealised view of the countryside, harking back to a time of innocence, before mechanisation, which had, as a corollary, produced the weapons of the early 20th century which had turned once fertile farmland in France into a murderous quagmire. Their countryside is idyllic, the sun always shines and all is good with the world with happy workers bringing in the harvest or tourists enjoying the countryside in their spare time. In their pastoral images there is no reference to the almost feudal working and living conditions under which most agricultural workers existed. As a result they created paintings which included horse drawn rakes and workers harvesting with scythes – backbreaking and low productivity labour. 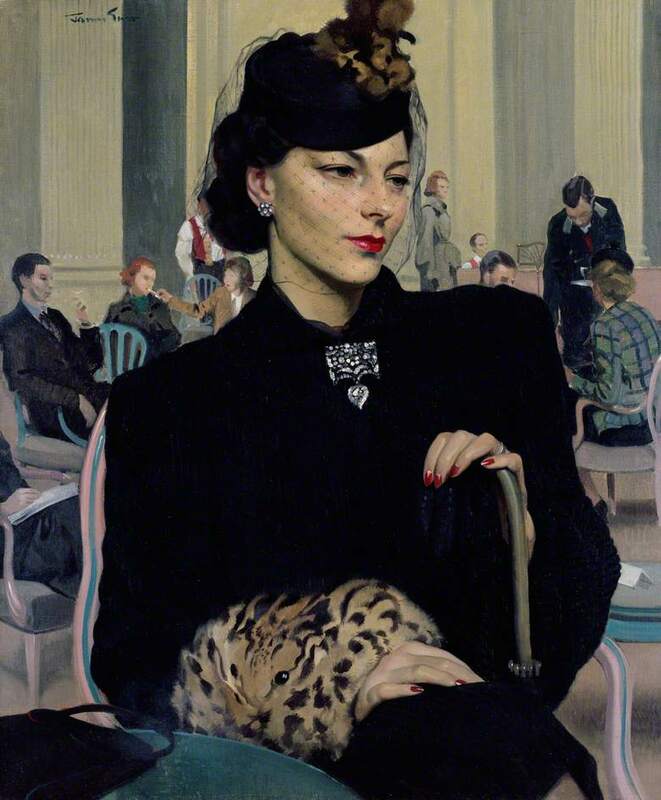 British Realism included no drama, narrative, or anecdote. It doesn’t really tell a story. It’s more like a photo of a specific time, location or individual but it’s a photo that doesn’t have a back story. It’s an image frozen in time but without any indication of a past or a future. But ‘Realism’ doesn’t mean real. Pauline Waiting (Gunn) are images of incredibly beautiful women, perfect in every way. But no one’s that perfect. All of them oil on canvas, the style which results in a ‘brushless, flawless finish’ is used to produce an impossibly flawless image. The paintings look the same as they do in the catalogue – like large, blown up (and retouched, or, perhaps I should say Photoshopped) photographs. The only difference with the originals is that when close up you can actually see the small hairs on these women’s faces and arms. Their perfection is what gives them away as paintings – such technologies in retouching weren’t available at the time. The artists aimed for, and achieved, perfection before the ravages of time would take that away forever. Standing in front of these portraits you know Oliver Cromwell, with his ‘warts and all’, would not have been a welcomed sitter in these technicians’ studios. 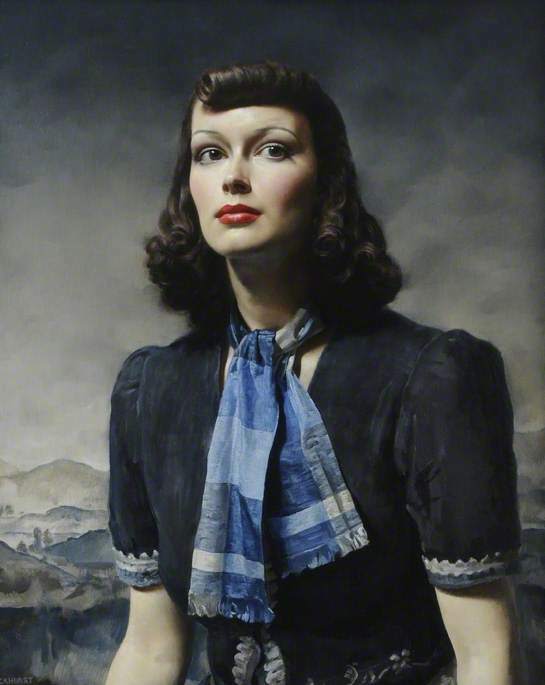 Some artists during this heyday of British Realism also played around with materials, reverting to tempera (using egg yolks, the norm before the invention of oil based paints) which produces a much softer, watercolour effect. What had, half a millennium ago, restricted artists in their desires to depict the world around them was reinvented to depict contemporary society – the medium not as restrictive as once thought. They rejected oil for the previously rejected egg. (The Fried Fish Shop). This is not surprising. Both were Communists and used their art to comment on the capitalist society that had just come out of the worst economic crisis (to that time) and was rushing headlong into the worst and most destructive conflict so far known to mankind. 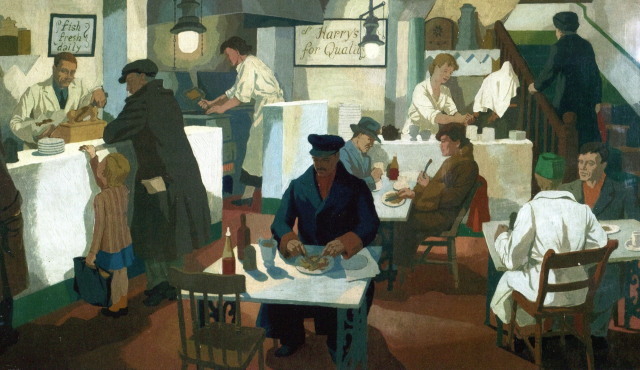 In depicting ordinary working people, even in the mundane act of eating fish and chips, they were referencing those who could take society along another, more prosperous and peaceful road. 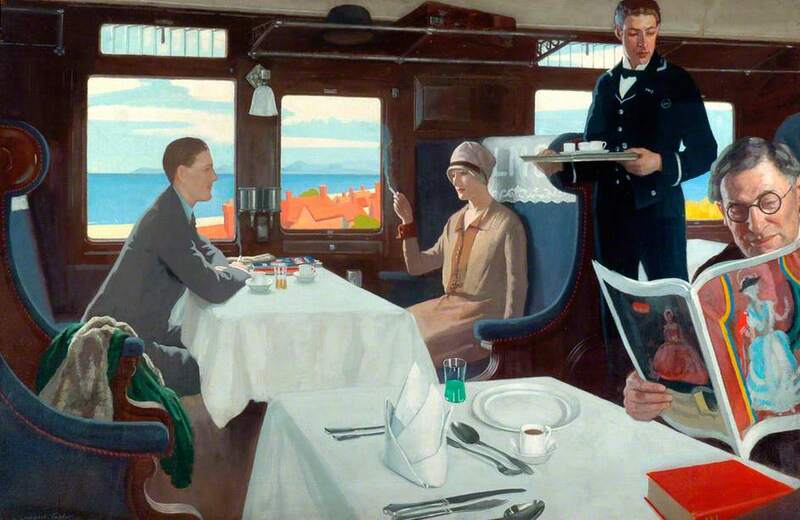 (whose Restaurant Car was used to advertise luxury rail travel). In this way they paralleled the work of Soviet artists who were producing public information posters in all fields of Soviet life at exactly the same time. Flawed but illuminating, museums and art galleries should hunt out further treasures of British Realism and present them to the public. Let the people decide what is ‘art’ and not leave it to the Turner Prize jury. 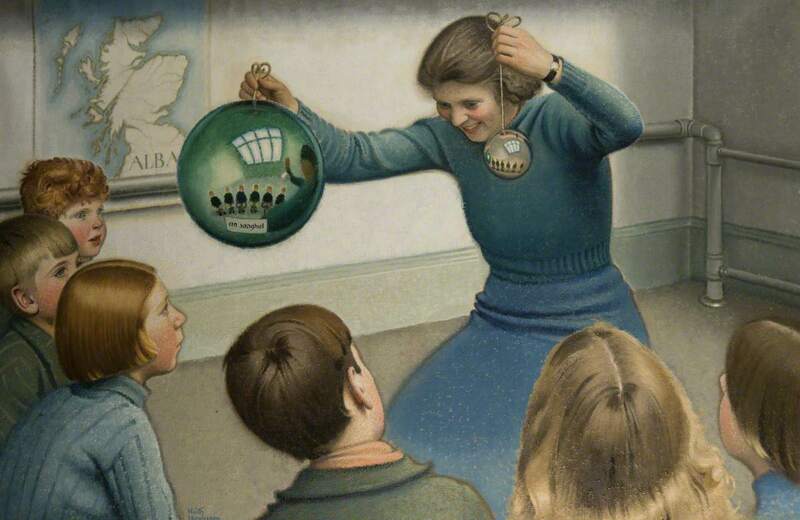 The National Galleries of Scotland produced a wonderfully illustrated book to accompany the exhibition, True to Life – British Realist Painting in the 1920s and 1930s, by Patrick Elliot and Sacha Llewellyn. Apart from the reproductions of the paintings that were in the exhibition the text puts the Movement into its context. 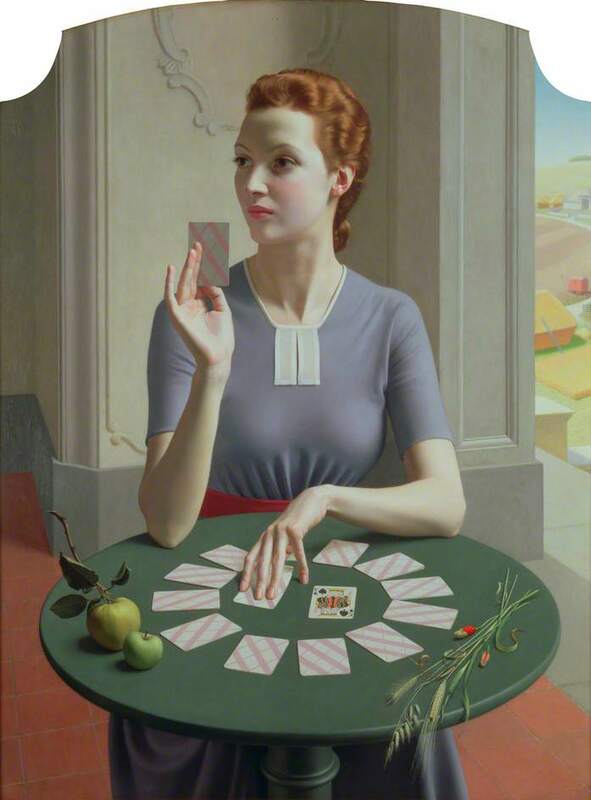 This entry was posted in Britain, Exhibitions, Socialist Realism and tagged british realism, clifford rowe, clive branson, edinburgh, fortunino matania, gerald brockhurst, herbert james gunn, keith henderson, leonard taylor, meredith frampton, scottish national gallery of modern art, socialist realism by Michael. Bookmark the permalink. Thank you for this article. It is “true to life”, which in this case means that it is true to the real event that has happened in Edinburgh. I enjoyed looking at the pictures, learning about the artists and bits of life mosaic reflected in it. Good “true to life” painting is always a little window to the time and place depicted by the artist. It provokes thoughts and emotions, it calls to learn more about the times and peoples that are in the pictures. To enjoy text we have to know its language. To enjoy figurative “true to life” art we don’t have to know anything. It is universal. It moves us to learn about who, and what, how and why is there. “True to life” as a style is different from Social Realism.